Connectivity between Maya LT and Stingray makes it easier to create 3D assets for use in Stingray. Send to Stingray export in Maya LT enables artists to export their assets directly to a Stingray project folder. Camera synchronization between Maya LT and Stingray enables artists to view whole scenes in the context of the Stingray editor so they can implement changes and evaluate them quickly. A live link between Maya LT and Stingray enables artists to view their models, animations, and materials in the context of the Stingray editor as they make changes in Maya LT.
Physically based materials created in ShaderFX within Maya LT can be transferred to Stingray so artists do not have to re-create their materials. Enabling the Stingray Tonemap in Maya LT helps ensure better visual parity in assets viewed in both Maya LT and Stingray. 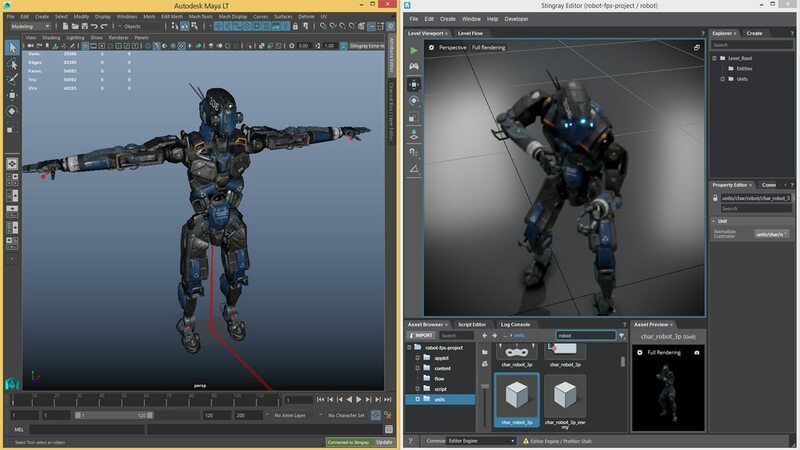 Indie game makers using Stingray to create ragdolls, cloth, and other physics-based simulations can optionally install the NVIDIA PhysX plug-in for Maya LT. Note: Access to the Stingray game engine requires an active subscription to Maya LT. You must install a plug-in to enable interoperability.